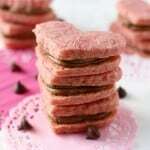 Home » Dairy Free » Chocolate Filled Valentine Heart Cookies (Gluten Free, Vegan). Chocolate Filled Valentine Heart Cookies (Gluten Free, Vegan). These chocolate filled Valentine heart cookies are a sweet and special treat to serve to your loved ones. Pretty pink hearts are naturally dyed and so beautiful! Disclosure: Thank you to PASCHA Chocolate for sponsoring this post. As always, all thoughts and opinions are my own. 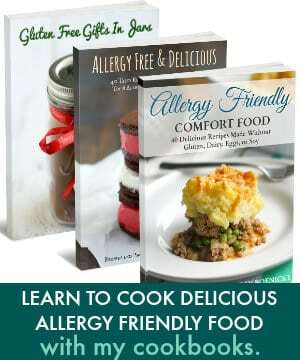 Thank you for supporting the brands that support my blog, and bring us great allergy friendly products! It’s almost Valentine’s Day, so let’s talk sweets. And you know how it goes when you have food allergies…you go into Target and see the Valentine section, and there are alllll the treats. All the pretty pink and red boxes and bags filled with chocolates and sweets that are made in facilities that contain nuts or peanuts or eggs or whatever it is you’re allergic to. And maybe you start to feel a little left out. At least that’s how I feel. Just like any holiday, when all the treats and things show up in the stores, it reminds me that holidays can be so tricky for those of us with food allergies in our family. That’s why I’m so grateful for PASCHA Chocolate. Not only is PASCHA Chocolate organic and free from the top 8 allergens, it is made in a dedicated allergen free facility. When I bake with PASCHA Chocolate I can relax because I know it is a safe, allergen free chocolate. Plus it’s absolutely delicious! I used the 55% Cacao Semi-Sweet Dark Chocolate Chips to make the rich filling for these chocolate filled Valentine heart cookies, and it was very hard to stop licking the spoon. I don’t like to use artificial food dye in my baking, so when I need to make something pink, I pull out the beets! 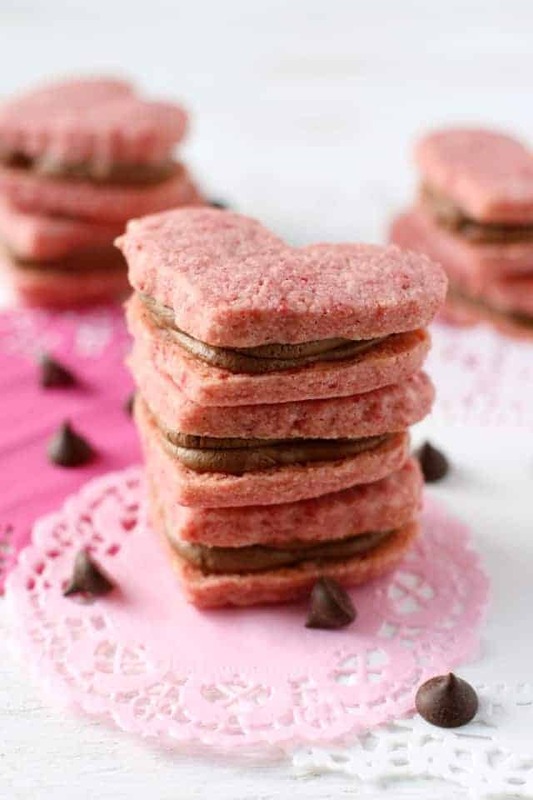 Beets are an awesome way to turn pretty much anything pink, including these chocolate filled Valentine heart cookies. 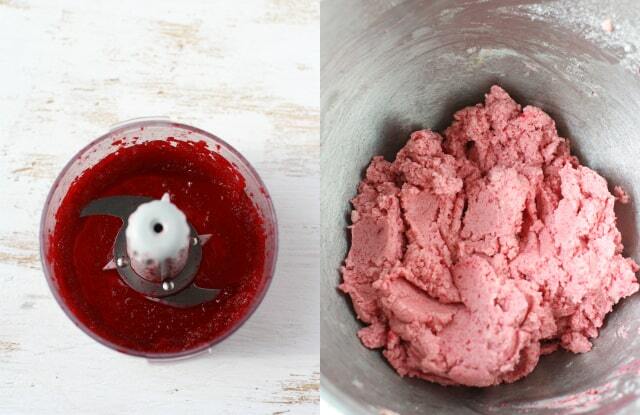 Simply put cooked beets in the food processor with a little water, and you will have a beautiful beet puree. You don’t need to add much to make the cookie dough a beautiful shade of pink. 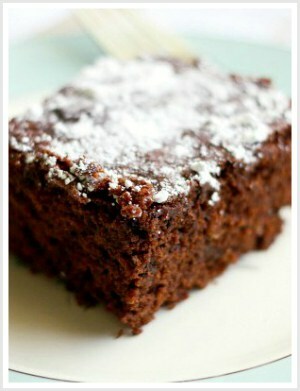 The filling is made with vegan buttery spread, confectioner’s sugar, and melted PASCHA Chocolate chips. 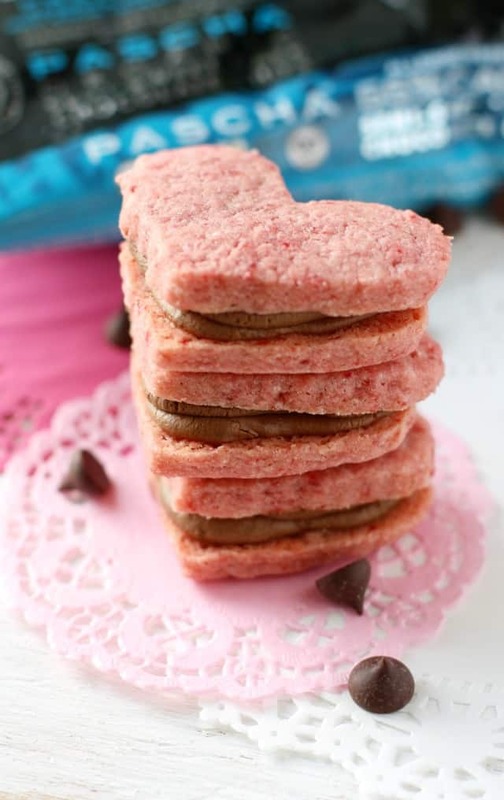 It’s so rich and delicious, and just perfect when sandwiched between two pretty pink heart cookies. I used a Wilton heart-shaped cookie cutter that is a little more than two inches across. If you use a smaller or larger cookie cutter, your baking time may vary. 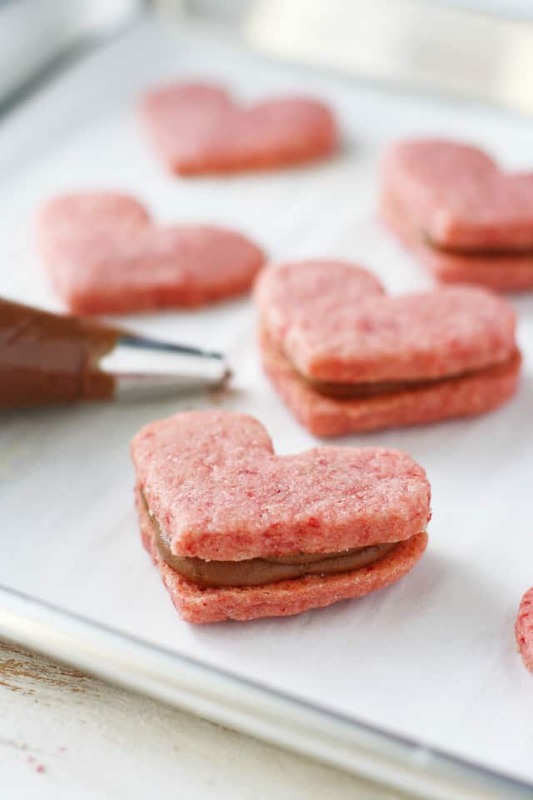 If you are making these chocolate filled Valentine heart cookies ahead of time, you’ll want to store them in an airtight container and frost them on the day you are serving them. 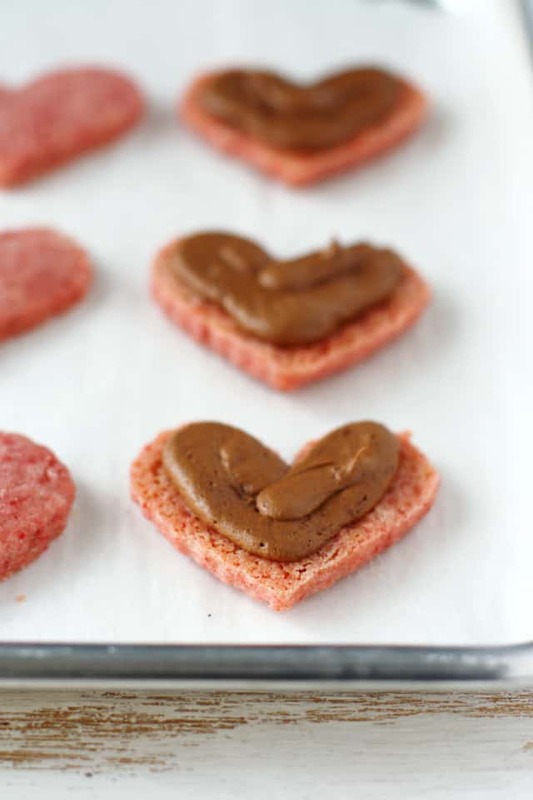 Chocolate filled Valentine heart cookies are a special treat for Valentine's Day! These naturally dyed treats are vegan and gluten free. Place the vegan buttery spread and the sugar in a mixing bowl and mix on medium speed until light and fluffy. Add the beet puree and vanilla extract and mix until combined. Add the gluten free flour and salt and mix on low speed until a thick dough forms. Pat the dough into two discs and wrap in plastic wrap. Refrigerate for an hour. Preheat oven to 350 degrees. Line a cookie sheet with parchment paper. Sprinkle gluten free flour on a rolling pin and rolling surface. Remove one disc from the refrigerator, unwrap it, sprinkle with gluten free flour, and roll into out until it is about 1/4 inch thick. Cut out hearts and place on the cookie sheet. Press dough scraps together and roll again, then cut out more hearts. Bake at 350 degrees for about 10 minutes. Let cool completely on the cookie sheet. Repeat step 5 with the other disc of cookie dough. While the cookies cool, make the filling. 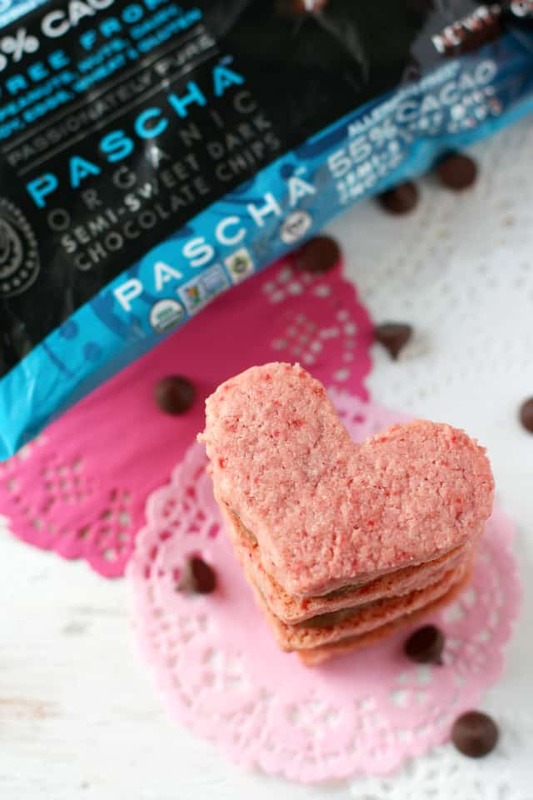 Place the PASCHA Chocolate Chips in a microwave safe bowl and microwave for 60 seconds. Stir the chocolate chips and if they are not fully melted, microwave for 15 more seconds or until melted. Set aside to cool for about 5-10 minutes. Once the chocolate is no longer hot, place it into a mixing bowl along with the vegan buttery spread. Mix together on medium speed. Add the cocoa powder and the sifted confectioner's sugar. Drizzle the non-dairy milk in a little at a time until a thick filling forms. Spoon the filling into a piping bag fitted with a #12 round tip. Pipe the filling onto half of the cookies, and place another cookie on top. Enjoy! These cookies should be stored in the refrigerator if not eaten within a few hours. *To make your own beet puree, simply peel and chop up a beet. Place in a pan and cover with water. Bring to a boil, then reduce heat to medium. Cook until beet is fork tender, about 15-20 minutes. **I used Namaste Perfect Flour Blend, but if you use a different flour, you may need more or less. The dough should be thick and roll-able, so use your judgement. Each gluten free flour blend is a little bit different. These cookies were a big hit! We’re having a little Valentine exchange party here next week, and I think I’ll be making these again – they’re so festive. If you try them, please let me know! If you need more Valentine treats, try these chocolate Valentine cupcakes. « Blood Orange Banana Smoothie. Artificial dye free and yummy, what’s not to love! So yummy and I love that they are dyed naturally. These are so pretty! 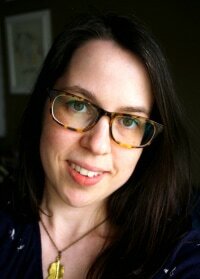 I am excited that Whole30 will be done in time for Valentine’s day! 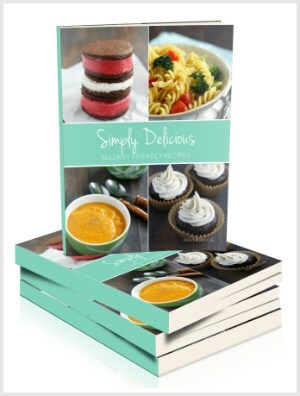 We think gluten may be something to keep an eye out for after Whole30, so these are the perfect reintroduction treat. These look gorgeous for valentine’s day! These are seriously gorgeous, Kelly! Anything to do with hearts, chocolate and pink is an instant win with me, and the fact that these are naturally coloured with beets just makes me love these even more! I don’t think I could ever bring myself to use artificial food colouring! These cookies are SO pretty! These are so sweet! And I bet they’re absolutely delicious too! Looks delicious! What a fun V-Day treat! I’ve got to get my hands on some of that chocolate! It looks amazing! Also, I love the valentine’s day treats – they’re all so cute! Thank you! Yes, try to find some PASCHA Chocolate, you won’t regret it!